Following the success of a joint venture, two Barnt Green businesses have decided to bring all their services under one roof. Greens Cuisine and Warwick’s butchers, which launched Barnt Green Pig Roasts & BBQs in 2010, are separate businesses but will soon be based in the same premises, offering customers a one-stop shop of delicious culinary options. Warwick’s has undergone a refurbishment, with the Hewell Road shop extended to accommodate Greens Cuisine as well as the ever-growing external catering business. The new look will be unveiled on Thursday April 11, followed by a Grand Opening at 10.30am on Saturday April 20 complete with canapes, champagne and celebrity guests. . . DJs Foxy and Giuliano from Free Radio! 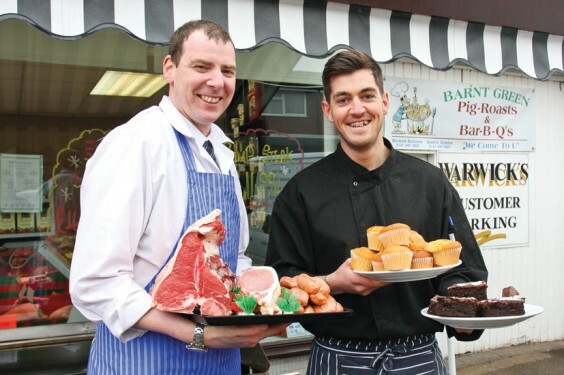 Both businesses will continue to provide the same high-quality produce which has made them so popular with people from Barnt Green and beyond – the perfect reason to support your local traders. And, in the wake of recent scares over the content of ready meals and meat products, customers can rest assured that they are buying local, traceable products! Speciality cheeses, artisan breads, and homemade pies and cakes are available from Joe Baker of Greens Cuisine, while Joe’s home-cooked ready meals range from lasagne to lamb shanks in red wine, always using seasonal produce. Butcher Warwick Savage offers superb locally-produced meat such as 21-day hung steak, award-winning sausages and a selection of prepared BBQ meats, plus a wide range of other goods including gluten-free items. Barnt Green Pig Roasts & BBQs has gone from strength to strength, catering for any event from small parties (minimum of 20 people for a BBQ, 50 for a pig roast) to gatherings of more than 500 people. As well as superb food (including paellas alongside BBQs and pig roasts), Joe offers a complete event management service including hire of marquees, tables and chairs, cutlery and crockery, serving staff and mobile bars to name a few. The pig roast includes a pork bap, stuffing, gravy and apple sauce, all provided by Warwick’s, while Greens Cuisine creates the additional items such as salads, coleslaw, desserts and cakes (including wedding cakes). Prices start at just £3 per head. For the BBQ, you can choose five meats from a list of about 15, including chicken kebabs and miniature steaks, plus three different salads – all for a starting price of £5.99 per head (based on 100 people).